Caught On Video! 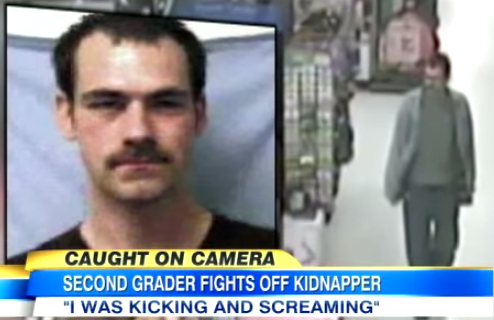 Child Escapes Kidnapper In Walmart. A man tried to kidnap a little girl from a Walmart store, but he did not expect her to fight back the way she did. Britney Baxter, 7 years old, was left in the toy isle buy her mother, while she shopped for produce. While the little girl was looking at the toys, a man grabbed her, put his hand over her mouth and proceeded to take her out of the store. But Brittany fought back. “Yeah, I was just like trying to do like this and kick as hard as I can,” Britney said. Brittney fought back so hard that the man dropped her and ran out of Walmart. It was all caught on surveillance video, even the man getting in his car and leaving the store. Police wasted no time in reviewing the surveillance footage and finding the kidnapper. Police say 25-year-old Thomas Woods was recently released from state prison. Words matched the video, but denied being in Walmart. He told reporters after he was arrested, “I didn’t bother nobody, I was never there”. Woods was later charged with attempted kidnapping. Britney’s parents are happy she remembered her stranger danger training. “If this can help save another kid, then that would help save somebody else,” Brittany’s mother said. And little Britney shared some advice, “You try to get away and go tell somebody that you trust”.